Looking for ideas for Mods? I came across this page while surfing the net. 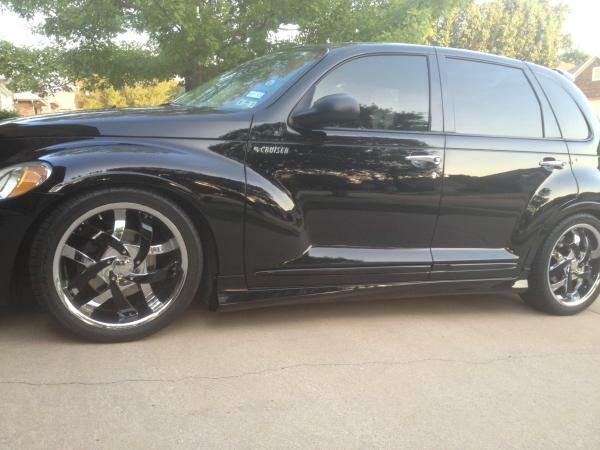 Amazing mods to PT Cruisers. I'm feeling a little discouraged.. I have to hide some more money from the woman! Re: Looking for ideas for Mods? there's a lot of great ideas out there. I saw a few cruisers i recognized like Wayne's, John's and Don's. someone once said that our cruisers were made to be customized. Motorhead, NitroPT and randyincctx like this. You can go retro or lower it, add factory ground effects, upgrade engine, get a nice tune, add some subs for a better tune. Last edited by Busa_Powered; 23 Jan 2014 at 02:34 am. What setup are you running to achieve the stance in your foto? That stance is pretty NICE. Whether the Cruiser is a practical daily driver, versus only a Sick Show Car. Stuff like the Lambo doors are not really all that practical. My problem is, even though I have modded a lot on my PTs, I really can't afford to only have show car that is "trailered" from show to show. Plus the storage costs. If you have Gen 2, and use the rear hatch for a lot of hauling (even just my golf clubs and cart in & out of the rear hatch), a custom rear step pad is the most practical and cool mod I have ever done. And, I think that I was the first ever! I never saw any other photos of one! On the 2005 Dream Cruiser vert, I'm going to just do protective film this time to prevent scratches.